This huge antique chime clock was made in the late 1800s by Winterhalder and Hoffmeier, known for the quality of their chiming clocks. 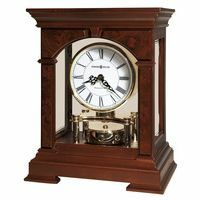 The solid oak case with ormolu trim work is massive at 28.5 inches tall and 16 inches wide. The trim work on the sides and the feet show some wear but it is in keeping with the age of the clock. The decorative urns on top of the clock are solid brass and could be beautifully polished if so desired.The ornate dial is in great condition with some patina in the center of the dial. 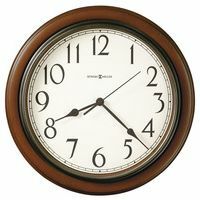 The two subsidiary dials are to control the speed of the clock and the choice of the clocks chimes. This clock can play Whittington on eight tuned bells or Westminster on four deep sounding gongs -- its your choice. It will chime the quarter hours and then strike the hour on the hour. This is an extremely impressive clock both in size and sound. 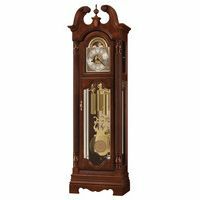 If you have been looking for one of the best chiming clocks you could buy this is it.